Two, four, six, eight, Barney wants to celebrate! While playing a game of Hide and Seek in the park, Baby Bop realizes that she can’t be the one to count to ten because she doesn’t know how — so Barney and the kids jump right in to help her. A trip to a make-believe market and a magical parade of numbers help to show her how exciting counting can be. While having fun, the kids learn an important lesson — you can’t go wrong when you have friends to count on! Recognizing numbers has never been so much fun when Barney & Friends™ use songs, rhyme, dance and laughter to help little ones learn to count in Barney™: A-Counting We Will Go coming to DVD from Lionsgate and HIT Entertainment. This special learning edition DVD comes with a 64-page coloring and activity book, perfectly timed for when preschoolers head back to school and need to sharpen those counting skills! Trusted by moms and adored by children, Barney displays sharing, caring, imagining, dancing and learning on television, online and through live events, home entertainment and publishing. The Emmy award-winning series, Barney & Friends™ is one of the top-rated preschool shows today, airing on PBS KIDS® and Sprout. 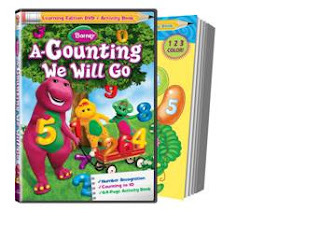 *Follow me @jamaise at Twitter & Tweet this : RT @jamaise #GIVEAWAY #WIN -Barney~ A-Counting We Will Go DVD And Activity Book http://bit.ly/8ZIOBw Ends 10/10 tweet each day for one entry each ! My grandson would love this. Hes 3 and I have full custody of him. My daughter lost him to the state. My littel Major would LOVE this DVD. He absolutely ADORES Barney! He is two!! I like PBSKIDS on facebook! I follow PBSKIDS on twitter! I follow you on GFC and my little 2 year old son would definitely benefit from this prize! My son would benefit from it, he loves Barney! Thanks for the chacne! I follow you! We would love this for our son. He is 18 months and knows 1...2, then he just keeps saying "1... 2... 1... 2..." When we say "what about 3?" He goes "3... 4... 3... 4...". It is too cute! My 17 mon. old son would love this DVD! He does not own any Barney DVD's and it's hard for us to catch on TV. #1 I am a facebook fan of PBS kids. #2 I am a facebook fan of PBS kids. I entered the Bottom Bumpers Giveaway! #1 I am a follower of Wishing Penny blog. #2 I am a follower of Wishing Penny blog. #3 I am a follower of Wishing Penny blog. This would be a nice fun way for my daughter to practice counting!